► Which does luxury best? Food for thought, that. Because it's Germany that is perceived to have cornered the market in luxury motor cars (Rolls and Bentley aside, obviously. Oh, hang on...). This is the same nation noted for donning sport coats of entirely dubious hues, wanton nose-vole growth and the blatant wearing of budgie smugglers in a public place. Lob into the equation a burgeoning Chinese market, wherein both four-door flagship limousines and excessive bling continue to prove all the rage, and it's interesting to note – in the context of a brand new, fourth-generation Audi A8, Mercedes' heavily facelifted, sixth-generation S-Class, and BMW's sixth-generation 7-series from 2015 – the extent to which everybody's favourite Teutonic triumvirate has been able to restrain itself. 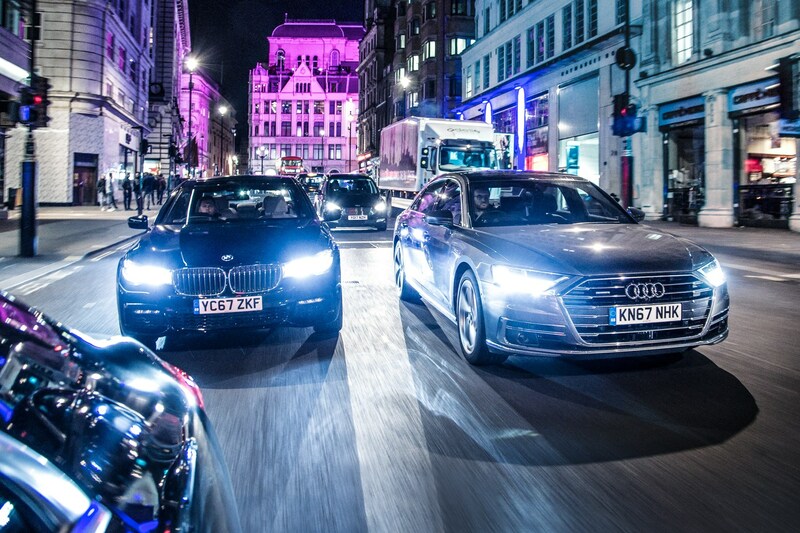 The Audi A8L 50 TDI quattro, BMW 740Ld xDrive M Sport and Mercedes-Benz S350d L AMG Line are each £100,000 machines. Or at least they should be. List prices of £72,210, £81,770 and £75,505 seem to me an irrelevance if they must here rise to £108,780, £96,525 and £103,305 respectively in order to bring the accommodations up to scratch. 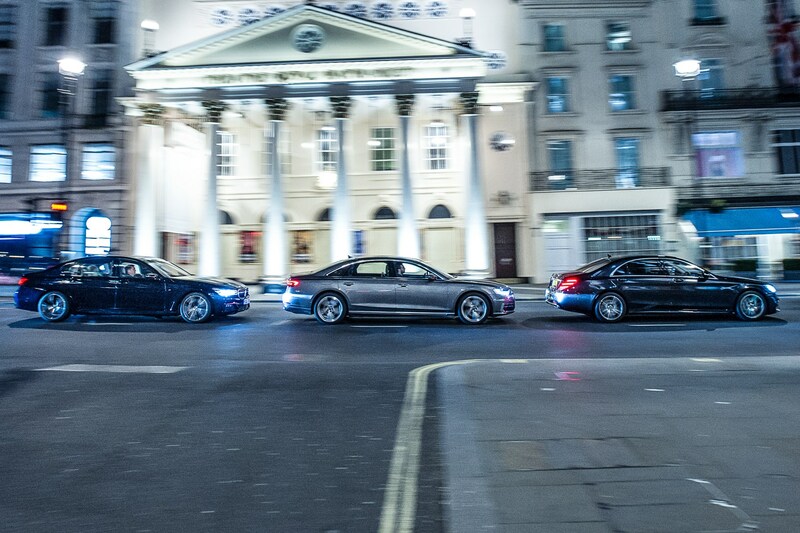 That, in the case of the A8, constitutes over thirty six and half thousand pounds of optional extras. Surely, when you reach this price bracket, you should expect to find a long-wheelbase limo fully tricked out, with every toy, joy and fiddly inconvenience already included in the asking price. After all, who wants a banana split with no cherries or squirty cream? Who wants to be shown to a hammock on a superyacht because the owner could only stretch to the hull and a brace of marine diesels? So, what is a saloon car this expensive supposed to look like? How do you pronounce £100,000 in pressed metal? The answer, of course, is that – unless you wish to incur the wrath of Ms Chanel – you don't. As any automotive designer will tell you, the only possible external outlet for the expression of the technological wonders lurking within is in the lamp clusters. 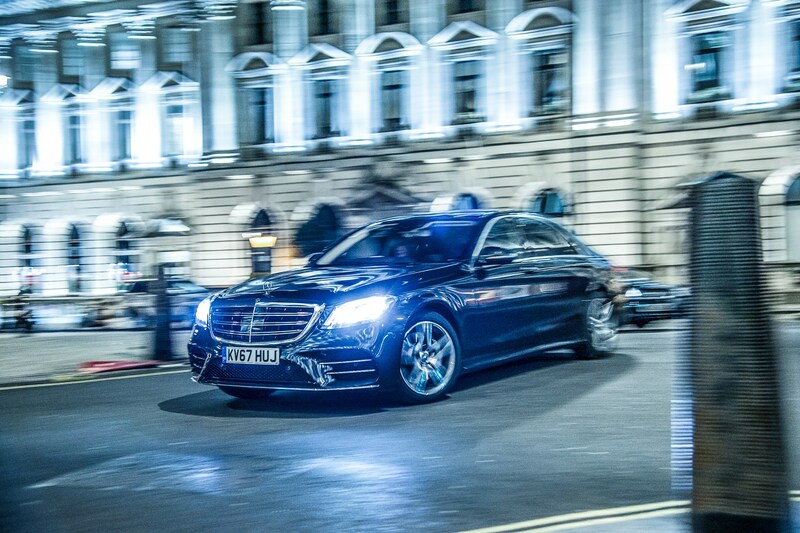 Good job too because, on any night in Knightsbridge and Piccadilly, S-Class Mercedes are thicker on the ground than dandruff in a Salvation Army soup kitchen. And they're all black. The only lack of restraint in evidence, then, and the only way to tell newcomer from predecessor, is in the new S-Class's triptych-themed headlight clusters, which will also identify the model within the Merc family in a coal bunker; the S-Class now sports three LED clusters, the E-Class two and the C-Class one. We're well familiar with a 7-series that's been around for a while; a largely handsome offering with some pointless twiddly bits appended wherever a panel risks looking too bland. But, for maximum fiddling while chrome returns, we must look to the new A8 which, in recognition of the lure of the Chinese market, has embraced it wholeheartedly. While the residual wheelarch blisters of rally quattro fame are a lovely touch, adding delicious bravado to the Audi's flanks, the application of so much bright metal is not. The lower rear bumper detailing is a mess, and the front grille has, um, matured from inflatable doll with chrome lipstick to same with the addition of brace-work that wouldn't look out of place in a teenager's mouth. 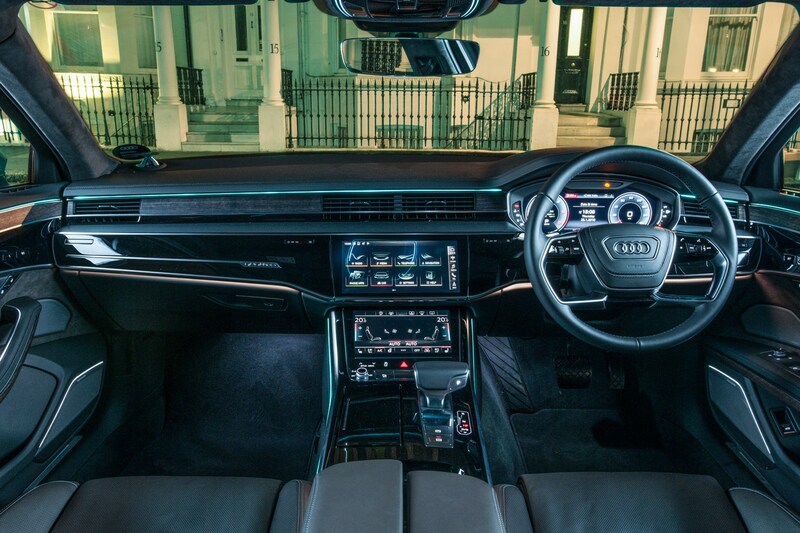 Own a long-wheelbase A8 and not only will you be able to afford a daily, you'll also need one to return the dashboard to its pristine, fingerprint-free state every morning before you climb aboard. There's nothing worse than lagoon-black surfaces covered with what looks like the aftermath of line-dancing night in a Nashville gastropod bar, as the Audi demonstrates after just one MMI induction course evening. In the interests of minimalism, when the Audi is off, everything is flush: piano black obscura. The dashboard air vents lurk behind panels matching the trim, easing into view with a complication of mechanical engineering that doesn't bode well for rattle-free longevity, while the tweeters of a £6350 Bang & Olufsen sound system ooze from the dash like the sinister surveillance drones of some evil, high-fidelity-obsessed empire. Despite the fanfare (literally, alas) and theatre associated with firing up the A8, you still have to press and hold the memory button to put the driver's seat positioning back to where you left it. Odd decision. Incidentally, you also have to switch off lane keeping assist every time you climb aboard. This is becoming increasingly prevalent in new cars. Please stop it. The A8 sees Audi continue with a high-tech screen crusade first realised with the Virtual Cockpit. But now, having first been bastardised into a less than perfectly intuitive state, the MMI rotary controller we used to know and love has vanished altogether, and we must re-learn control of Audi's multimedia interface via twin centre-console touchscreens. This takes a while, but is reasonably intuitive once you learn your way around. Less pleasingly, the potentially slick, pseudo-haptic feel to touchscreen operation requires an over-mighty shove of the fingertip to wake a slumbering icon, detracting from the anticipated new-tech thrill of the deed. Marrying an excellent driving position and first-class driver's seat comfort with by far the most modernist interior execution here, and London's winter gloom held at bay by 'Caribbean' ambient lighting, the A8's cockpit is a starched-linen-crisp, gently funky place to be. Nonetheless, one can't help wondering if just a whiff of good old-fashioned switchgear practicality hasn't been washed away in the interests of flush surfacing. Now, you either like the way BMW does things, or you4 don't. The 7-series sports, perhaps, a younger man's interior than that of the S-Class; nicely put together but a tad glitzy and, frankly, now starting to show its age in a way that the blatantly more conservative and cuddlier Mercedes-Benz interior manages to avoid. Perhaps this is because the latter also managed to avoid the evolutionary hiccup wrought by the ministrations of Chris Bangle, from which one can't help feeling that BMW's interior design department is still struggling to extricate itself as quickly as possible, yet without scaring the punters. This is a three-year-old model, so we won't bore you with overmuch detail. Suffice it to say that iDrive system control has been sufficiently reworked as to finally come into its own; that the driver's seat is by far the firmest here but doesn't upset the driving-experience apple cart in the way the obscenely fat-rimmed helm manages to; that faux-analogue driver's instruments are pointless because they're locked in position by brushed-metal crescents; and that the air-conditioning is relentlessly noisy, even when it must, surely have reached the required temperature. Oh, and two fingers to gesture control. A clear winner in the accepted traditions of opulence stakes, the front of the S-Class is a wonderfully cosseting environment. It's as comfortable to back into as warm butter and the driving position is faultless. I remain gently unconvinced by the polished pizza-oven-paddle double-screen instrumentation, but it is very well executed. Cross-stitched dashboard panelling, strange and unhealthy things done to innocent wood, over-the-top Burmester speaker grilles, and a vile brown colour to the dashtop and seats all detract from what is actually a rather classy interior. There are, however, some anomalies. The multimedia controls avoid the need to touch any screen, thus retaining a pristine appearance without recourse to Parker's kerchief. But why obscure a perfectly serviceable rotary knob beneath a touch-sensitive pad that simply gets in the way? Likewise, the steering wheel is lovely to hold, but not behold. Most of the switchgear is swathed in brash brushed metal and impossible to identify even when backlit. And new swipe, stab and hope touch-sensitive buttons are nothing like as precise as the previous-generation switchgear. Does anyone try these new systems while driving, or do they just sit in a lab? Up front, beneath that peaked cap, Parker might feel a little short-changed by the S-Class which, unlike its rivals here, won't allow him to watch telly unless he waits until Lord Penelope is out of sight and sneaks into the back. There, however, installed diagonally opposite the driver's seat, he won't be disappointed by a full ottoman reclining to a snooze-worthy 37 degrees, a headrest of consummate comfort and the facility to shunt the front seat out of the way, the headrest folding forwards and a footrest appearing from below at the same time. The Benz's rear centre console has a superbly ugly plastic protuberance sticking out of it reminiscent of HR Giger's Alien mid-yawn. This houses the in-car phone and is a platform for wireless recharging of a mobile I don't own, but offers nowhere to house the rear entertainment remote control. You can't keep it in the console, because that's full of fold-out tables on which you can only type if you're acclimatised to skittish keyboards prone to levels of rebound more usually associated with a snare drum. 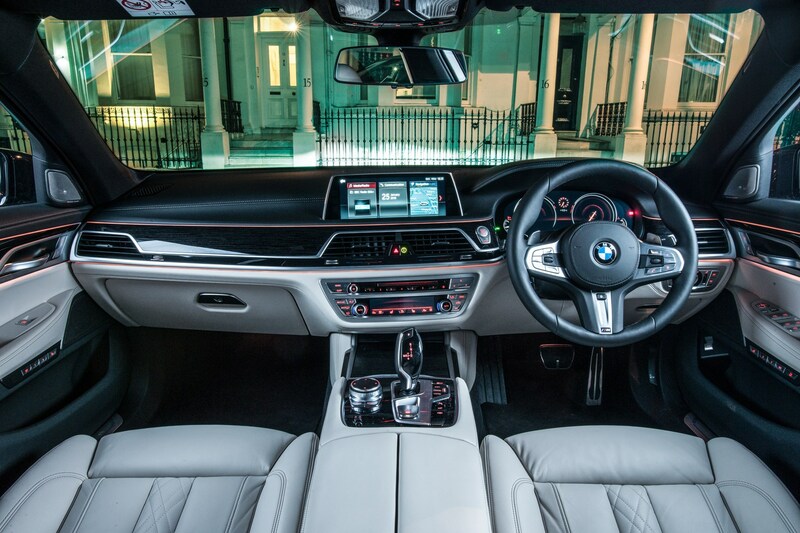 The BMW take on the boss's chair is almost as clever but not almost as comfortable as that of the S-Class, and the tablet-style rear-seat control just doesn't want to work at all. I've tried it before and know it does, just not this one. It's actually the Audi which comes closest to matching Mercedes' rear-seat comfort, despite the fact that the footrests are merely carpeted wedges to be hoofed at will around the well. Another odd decision, the rear headrests will not adjust automatically, and nor does the seat return to its memorised position automatically, having thrummed backwards to let you out. 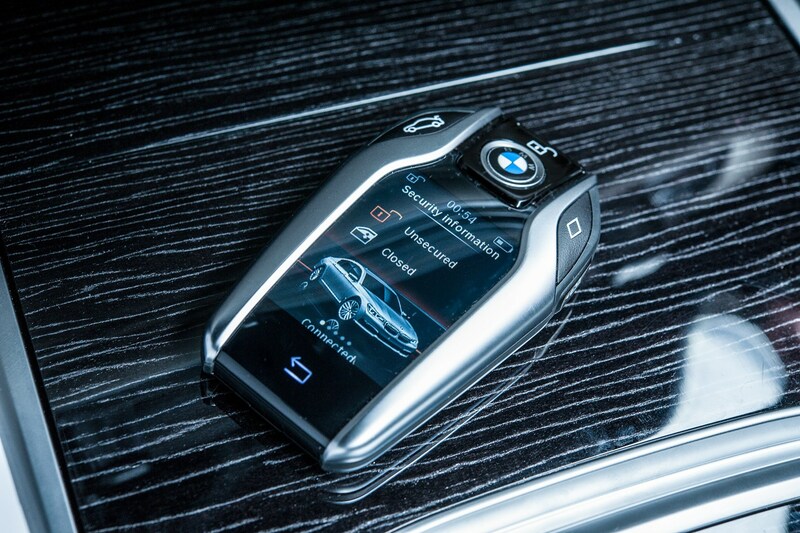 As with the BMW there's a demountable tablet with which to control various functions including the multimedia system. This one works. All three lounge lizards are armed with six-cylinder, give-or-take 3.0-litre turbodiesels. 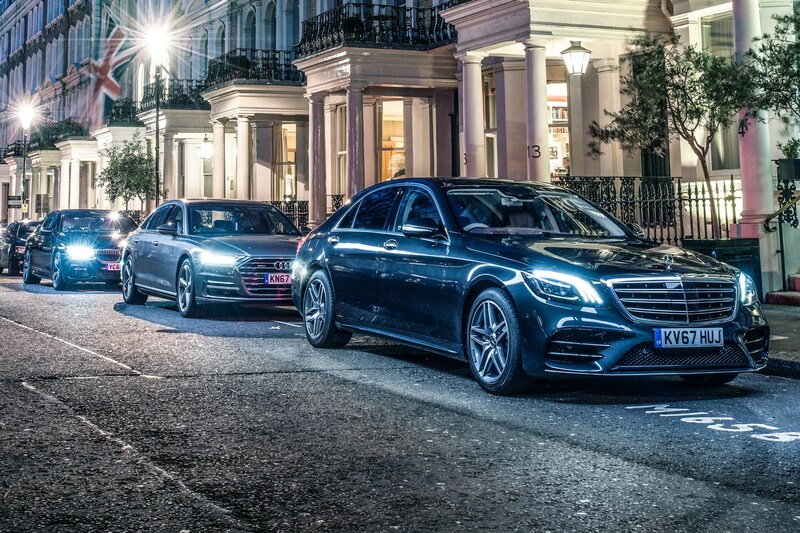 The S-Class features an all-new, twin-turbocharged straight six which, matching the Audi V6's 282bhp and 442lb ft precisely, replaces the V6 in the interests of modularity, more room for ancillaries – such as the location of the AdBlue system closer to the block – and a claimed improvement in fuel efficiency which our test figures do not substantiate. BMW's straight six boasts more power and a significant hike in torque, the only downside to the resultant performance superiority being that it's intrusively noisy at idle and remains the most vocal unit here as it goes to work. Both the S-Class and 7-series largely conform to the dynamic stereotypes of their marques; the former clearly feeling its foremost responsibility is to simply obliterate any potential intrusion into the opulence and calm of the cabin, the latter maintaining BMW's pedigree as the most engaging driver's car. The new A8, however, proves somewhat more problematic to pigeonhole. Its throttle feels entirely synthetic, a first push eliciting very stodgy pedal movement and little response. The helm feels taut and nicely responsive, undoubtedly abetted by four-wheel steering, and has less sneeze factor than the S-Class. Noise on the move is nicely muted; there's very little wind roar thanks to double glazing, and the engine only puts in an aural appearance if you really floor it. Muted road noise from the 20-inch rims dominates, and the suspension transmits thumps and bumps to the cabin far more readily than either BMW or Mercedes, yet the ride quality is largely excellent. The Audi's four-wheel steering is a boon, eliciting pleasing agility in the urban environment. The rear-wheel-drive Mercedes, as ever, spins around with the alacrity of a London black cab, while, with all-wheel drive and no four-wheel steer, the BMW can be outmanoeuvred by a respectably sized yacht. 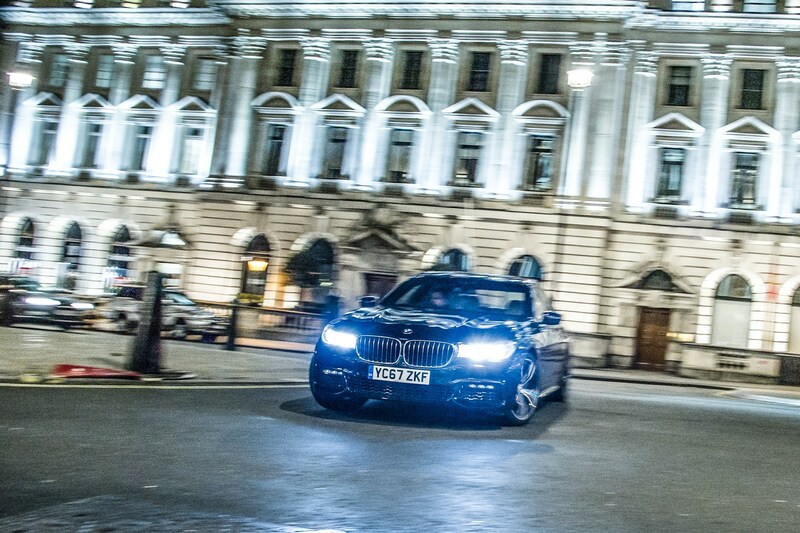 At speed, the BMW 7-series takes the driving honours, perhaps predictably. It's not as immediately sharp on turn-in as the Audi, so remains a big car in feel and never really shrinks around you. The ride quality, though, is far better than you might expect; it doesn't thump over potholes and rough spots as much as the A8, and double glazing keeps wind noise from door mirrors at bay. Isolation, then, but not splendid isolation. 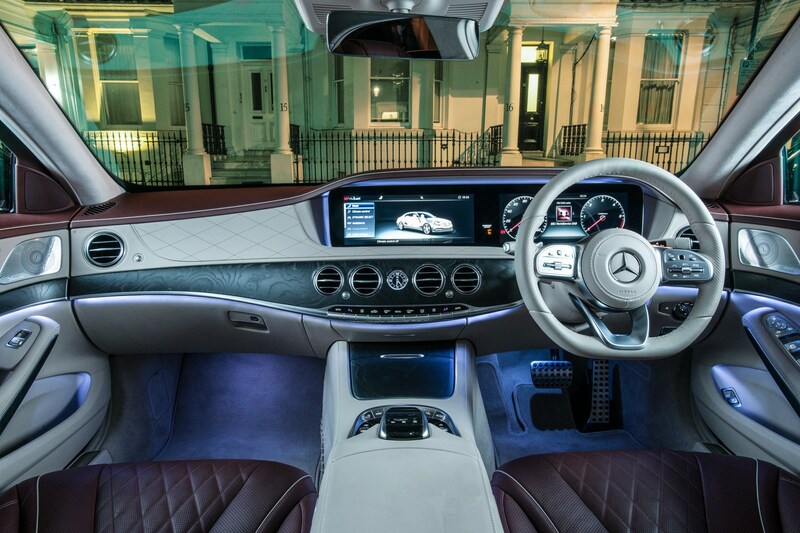 If that's your goal then only the S-Class delivers in spades, whether you're behind the wheel or opulenced-out in the back.Hilariously seamless nine-speed automatic transmission ensures it makes the smoothest progress, it has the quietest cabin and it has far and away the most comfortable seating, both fore and aft. It may not be the most engaging of these three to drive, but it gives terrific waft, and still somehow manages to convey a sense of crushing superiority at all speeds. 'Yes; money can't buy happiness,' someone once remarked. 'But it's more comfortable to cry in a BMW than on a bicycle.' Then again, it's even more interesting and appealing to do so in an Audi, and even better yet to sob in an S-Class. Though Coco Chanel may disapprove. 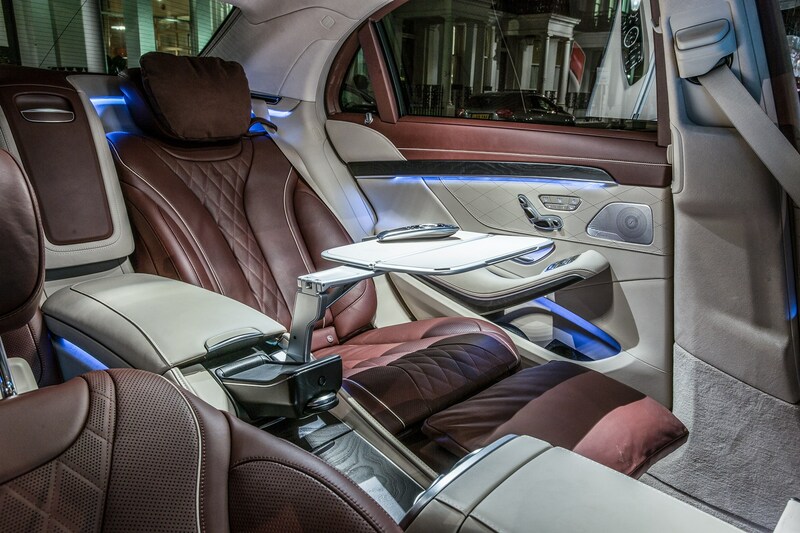 Accept no imitations: ultra-classy S-class wallops rivals on interior style and sheer refinement. Some gimmicky tech onboard and 7 doesn't waft like the Merc. Loves the open road, though. Jury's out on the new infotainment system and the car's just neutral; 7-series better to drive, S-class comfier.